I was born in Kuwait, my family moved to Lebanon when I was two years old and then moved to Dubai when I was nine years old. I‘ve been always into sports in general. During my teenage, I was into bodybuilding and then started bungy jumping by the age of 16. I then started my scuba diving and got my advanced PADI (Professional Association of Diving Instructors) license, then I thought I should also get my skydiving license and I did. 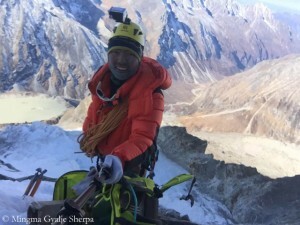 In 2015 I attended a speech by Omar Samra, the first Egyptian man to climb Everest (in 2007) and I was reminded about my goal: I’ve always wanted to climb Everest ever since I was 14. I have visited Nepal five times and flew over Everest twice and I always said I will climb to the top of this mountain one day. So I took the first step to see if I like mountaineering or not and took off to climb Mount Elbrus in Russia. This was when I got hooked and my mountaineering journey started. I’m am a strong woman both physically and mentally. I love laughing and I enjoy the simple things in life. I‘m a minimalist, so to me it’s all about the experience rather than material. I have two jobs when I’m not on the mountain, one is in finance, the other is my own business which means I work hard for my money. I‘m a loud person when I’m happy and I try to control it. I would consider myself between both an extrovert and introvert at this stage in life. Mind over matter is what I believe in. A positive, balanced and happy life is what I try to achieve all the time. Which of your qualities do help you the most in the mountains? Believing that I’m strong, being positive and laughing (especially when the altitude hits me) and of course now that its all about mind over matter which I actually tattooed on my hand as a reminder. 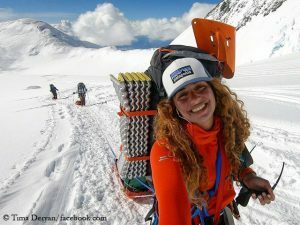 What does mountaineering mean to you today? 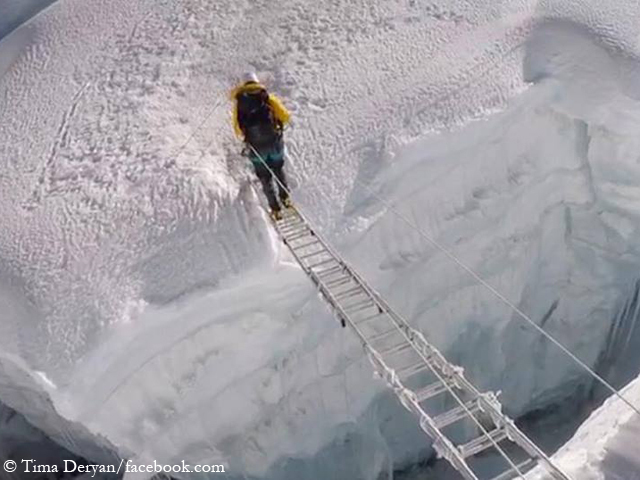 I honestly wish mountaineering is my job but this doesn’t work in my world. 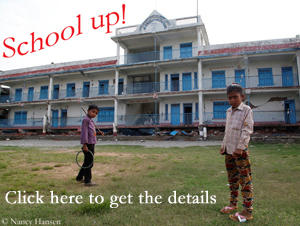 My dreams are big and I need to earn a lot to be able to achieve them. So now mountaineering for me is a run away from the standard city life and mainstream world. It‘s when I refill all my positive energy and boost my confidence. It‘s when I’m in peace with myself and I push all the limits happily. It‘s when I rebalance my thoughts and mentally heal. Mountaineering is literally my heaven on earth and happy place. 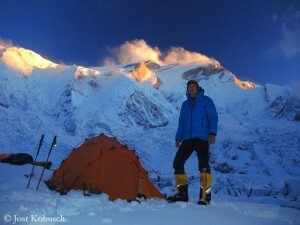 How do you prepare for Everest? Given that Everest has been a long time dream of mine, when I decided that I want to do it, I discovered that it takes about two months! 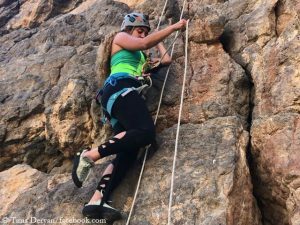 As a newbie, I continued climbing for three years until I gained confidence and learned enough to take such a decision. As for training, I do my strength training from 6am to 7am then I’m off to a long day at work. I come back and do my HIIT (High Intensity Interval Training) in the evening. I run ten kilometers one or two times a week, do indoor climbing two, three times a week and I’m always hiking over the weekend. How do you finance the expedition? I’m a minimalist, I live with my family so I really do not spend much of what I earn. Everything goes into mountains and trips. As for Everest, it is a launching event for my new company Yalla Cleaning (an online portal for cleaning industry). 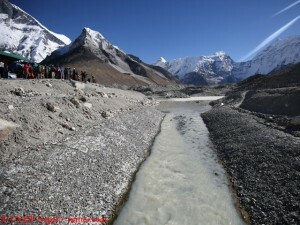 Part of my initiative is contributing to cleaning Everest, so currently working with the Nepalis on how I can help to bring the trash off the mountain through a system. 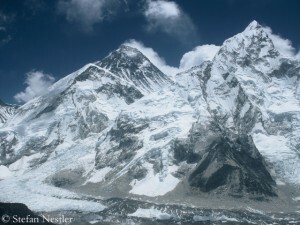 What are your expectations for Everest? I think anyone wanting to climb a mountain would have the ultimate goal of reaching the top. For Everest, my ultimate goal is definitely reaching the top but I am very well aware that things might go against my expectations. The fact that I have the chance to spend around 50 days on the mountain, be there and live the experience, it is way too beautiful. But to top the cake with the cherry, it’ll be great to come back home with the summit! So I really do not have a lot of expectations besides – expecting the cold, stainless-steel ladders, Khumbu Icefall, crevasses, and the epic basecamp life! 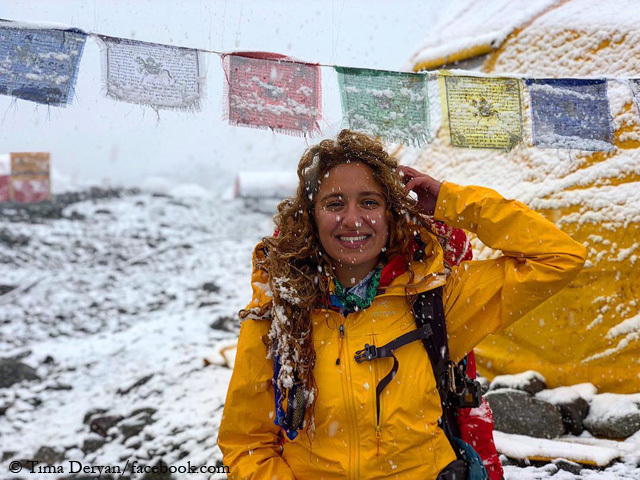 A woman as a mountaineer – there are not many in the male-dominated Arab world. What resistance did you have to overcome? I always say the Arab world is in a transition phase. It is true that it is male-dominated but women are rising up in all domains. Women in the Middle East are achieving the impossible whether it is in fitness, business, culture, music and entertainment. 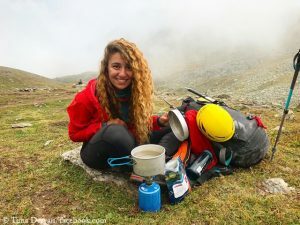 As I started my mountaineering journey, it was difficult to convince my family to travel alone knowing that I will be disconnected and they might not hear from me for a while. It was very hard for them to accept it but I managed to convince them. Otherwise, I did not really face a lot of difficulties kick-starting my passion. As for society, I usually have a lot of respect from both men and women when they know what I go through to reach the peak. Just like in any other part of the world, some people think I’m too crazy and my future will be complicated. I don’t really bother explaining instead I climb more and prove them wrong. It’s all about action at the end of the day. How do Arab men react to your mountain successes, how do Arab women? Both Arab men and women react in a beautiful way towards my summit successes. It makes me so happy to hear “we are proud of you”. I must say, I do get challenged by some men when it comes to fitness so they can prove a point. I accept it for fun. Whether I lose or win doesn’t matter but I make sure my message goes through which is: Women are strong creatures with a high pain threshold. 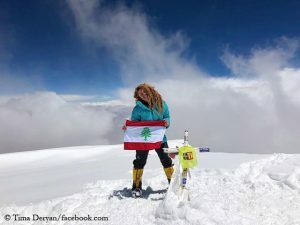 Is there also a message that you want to give to Arab women by climbing Everest? Yes. Through my Everest climb I would like to demonstrate that an Arab woman is able to fight all sorts of limitations that society imposes upon her. She can earn her freedom only by action. If she wants something she must work really hard to get it! Being strong does not mean not being feminine enough. Being strong is way more attractive than being “soft”. Arab women are still going through the phase of being independent and doing anything on there own. Most women still find it difficult to date to depend solely on themselves. So If I can climb Everest and depend on myself on the mountain then they can do anything. All it takes is courage and hard work. I want Arab women to know that they are beautiful, they are strong and they can conquer the world. But only with the right mindset. P.S. : By the way, the first Arab woman on Everest was the Palestinian Suzanne Al Houby, who reached the highest point at 8850 meters in spring 2011.